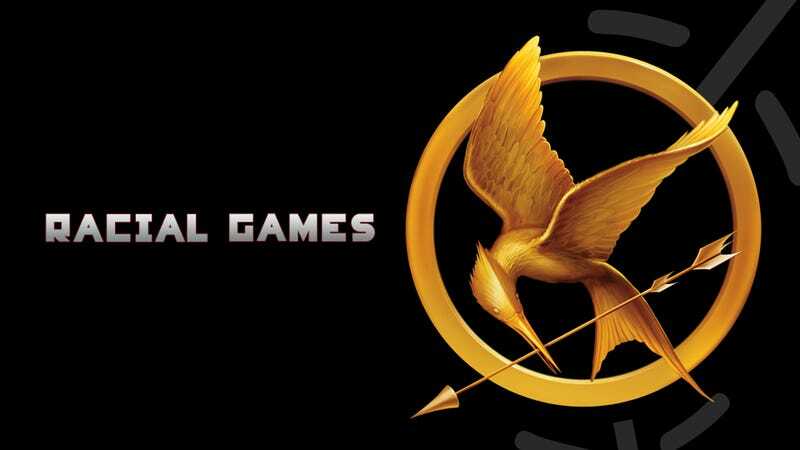 Suzanne Collins's book The Hunger Games deals with a dystopian society, and takes place in the fictional nation of Panem. Panem — most likely derived from the Latin phrase panem et circenses, which literally translates into "bread and circuses" — exists in the same geographical space as the current boundaries of North America, but was established following the destruction of modern civilization. (You'll also notice that many characters have Roman names.) This futuristic country is not all-white. It is diverse; there are many skin colors and hair colors, and in The Capitol, citizens dye their skin, and use surgery to alter their features. While some fans were shocked to discover that black actors were chosen to play the characters Cinna, Rue and Thresh, they should not have been: It's all right there in the books. Suzanne Collins very specifically described a world in which the blonde people were wealthy and the olive-skinned and brown people were poor. Race was built into the structure of the novels, and those who "skipped over" the part about Rue and Thresh having dark skin missed a huge part of the story. …Were not particularly intended to be biracial. It is a time period where hundreds of years have passed from now. There's been a lot of ethnic mixing. But I think I describe them as having dark hair, grey eyes, and sort of olive skin .…But then there are some characters in the book who are more specifically described. For instance: Thresh and Rue. Collins said, "They're African-American." Thresh and Rue will be [played by actors who are] African-American. It's a multi-racial culture and the film will reflect that. But I think Suzanne didn't see a particular ethnicity to Gale and Katniss when she wrote it, and that's something we've talked about a lot. It's all right there. A multi-racial culture. But let's look at each character's description. If we skipped a character, it's probably because there wasn't enough information about his or her physical appearance. Katniss Everdeen lives in District 12, which is coal-mining country. This area is called The Seam, and Katniss has the "look" of The Seam: Olive skin, "straight, black hair," which she pulls back into a long braid, and grey eyes. She's also "small in stature" and light for her age — one of the smallest tributes in her games. Some who have read the book will argue that this is an Appalachian look, and that Katniss lives in or near Appalachia, but since this is a dystopian future where races have mixed and geography is different and the gene pool has changed, it's pretty safe to say that Katniss is not necessarily Anglo-Saxon. Despite the fact that Jennifer Lawrence was chosen to play her, it could have been someone like Q'orianka Kilcher, who is part Quechua but was raised in Hawaii; or a younger Emmanuelle Chriqui, who is Moroccan/Sephardic. The point is: It's Sci-Fi. It's the future, She could be of Italian, Cambodian, Greek, Chinese, Muscogee, Choctaw and Sri Lankan heritage, all combined. All we know is that she has olive skin and "straight, black hair." Gale Hawthorne , like Katniss, is from The Seam. He has dark hair, olive skin, and grey eyes. Unlike Katniss, he's said to be over six feet tall. (Katniss also describes Gale as smelling like apples, sometimes alder smoke… and says his skin smells like oranges.) In one of the books, Johanna calls Gale "gorgeous." His good looks are mentioned throughout the series. Again, he is not necessarily white, as we know it. Except for the height, Gale could look like Mexican actor Gael Garcia Bernal. Funny how if you scramble the name Gael you get Gale. Prim is Katniss's sister, but has a different look, a "merchant look," like Katniss's mother. This means pale skin, blond hair and blue eyes (unlike the majority of the residents of The Seam.) She was also described as being quite small and frail — makes sense, since she was underfed for the majority of her life. Peeta is described as having "ashy blond hair that falls in waves over his forehead," blue eyes, and a stocky build. Medium height. As the baker's son, Peeta was more well-fed than most in The Seam. His skin color isn't mentioned. Rue, the fragile 12-year-old girl from District 11, is described as having "dark brown skin and eyes." Suzanne Collins was very explicit in the EW interview, saying of Rue and Thresh: "They're African-American." In the books, Collins adds that Rue has thick dark hair, dark satiny brown skin and "golden eyes". She is described as being small: 4' 8". Thresh, who also comes from District 11, has "dark brown skin" and "dark hair." He is described as having "strange golden brown eyes." He's described as being six and a half feet tall and "built like an ox." Again: Not just dark skin. Not olive skin. Not tan skin. Dark brown skin. District 11 is one of the poorer districts, and it is known for its "bountiful orchards" and farms. Agriculture is the livelihood, but almost everything they grow goes to The Capitol. If you live in District 11 and are caught eating any of the crops, you are executed. Just like slaves on a plantation. Haymitch is described as paunchy and middle-aged. He was "something of a looker" years ago when he won the games. He has the look of The Seam: Curly dark hair, gray eyes. 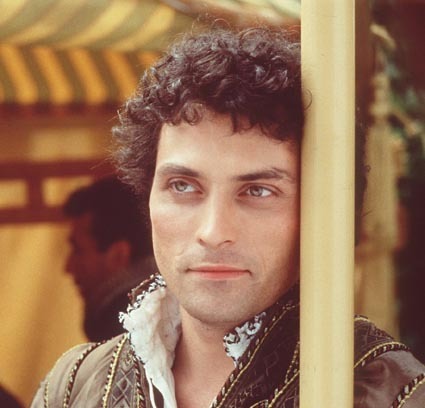 Like maybe Rufus Sewell from A Knight's Tale. Cinna is described as wearing a simple black shirt with matching pants. While most of the other people in The Capitol have dyed skin and outrageous clothing, his one "strange" fashion choice is gold eyeliner, "which brings out the gold flecks in his green eyes." Katniss describes this as attractive. Other than that, Cinna is just "normal" with with short brown hair. With Cinna, what was most important was the chemistry with Katniss. So Lenny Kravitz was a good casting choice, but Cinna could have been played by an actor with a Latino, Asian, or Caucasian background. Cato is strong, muscular, good-looking, and blond. His skin color is actually not part of the description. We could assume that he is white, but for all we know, he could look like English/Irish/Afro-Caribbean model Dudley O'Shaughnessy. Finnick doesn't show up in The Hunger Games but is a character in the following books, Catching Fire and Mockingjay. Physically, he is described as being extremely handsome, tall, muscular, and athletic, with "tan skin," "bronze-colored hair," and "incredible" sea green eyes. Again: Not necessarily white. Perhaps he has the look of a young Gary Dourdan. In any case, "tan skin." Not olive, not peachy, not pale, not brown. President Snow is described as being a "small, thin man, with paper-white hair and thick lips" that were surgically altered. "His eyes were that of a snake's." We might assume he is white, because of his name, and because he is the President, or because if he were olive, Katniss would mention it. But we don't really know about his skin color. Johanna is not in the first book, but a character who appears later in the series. She is a few years older than Katniss, has wide-set brown eyes and short, spiky hair. In Mockingjay she returns from The Capitol with a shaved head after being tortured. While her physical description is lacking, we know a lot about her personality: She is sly, perceptive, sarcastic and snarky — and sometimes vicious. For all we know, Johanna could be olive, tan, pale or brown. Caesar Flickerman is played in the movie by Stanley Tucci in a blue wig, and in the books, is known for changing the color of his lips, hair, and eyelids for each Hunger Games. Effie Trinket, like most Capitol Citizens, wears a brightly colored wig and bizarre clothing. Folks who live in The Capitol will tattoo and dye their bodies and get plastic surgery to alter their appearances — some even have gems implanted in their skin. Elizabeth Banks did a great job, but Effie could also have looked like Nicki Minaj. So there you have it. Some characters are racially specific; others are ambiguous. What matters is that this futuristic society includes — does not exclude — people of color. In 1966, when Gene Roddenberry created Star Trek, he purposely put toegther a mini-United Nations of a cast, including a black woman and an Asian man. Collins, too, saw that the way to comment on our society, in which a few are wealthy and look the same while the masses are poor and look different from the wealthy, was to include skin color descriptions in The Hunger Games. Skin color is part of the narrative. The lesson here is to read carefully. When a writer provides detailed information about a character, it's not something to skip over or dismiss. It's there for a reason.